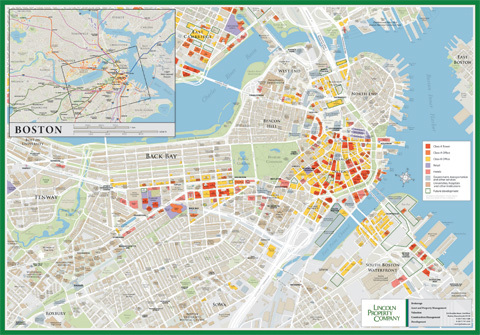 Detailed two-sided street map of the central business districts of Boston and Cambridge. Buildings are color-coded to show the classification of commercial real estate. The inset highlights public transportation and the footprint of the main map. Click on thumbnails to view portfolio pages. Hover over the sample to zoom in. Highlight a category of maps from the menu above. We offer a full range of cartographic services. Contact us today about your map project.